A former president of Fukushima, Eisaku Satou, told to a journalist about Fukushima Daiichi nuclear accident that “It is like a nightmare”. During his administration, he got a fax from the Nuclear and Industrial Safety Agency at the ministry of Economy, Trade and Industry in 2002 that TEPCO (Tokyo Electronic Power Company) was deceiving inspection records to hide troubles and cracks of nuclear reactors for many years. More shockingly, Nuclear and Industry Safety Agency got the information from a whistle-blower in 2000, meaning the governmental watchdog hided the information for two years. It was because the Agency gave the whistleblowing to TEPCO, and TEPCO told the agency “it is not true”. Then nothing happened for two years. Former governor, Sato thinks “Fukushima accident is not natural disaster, it is man-made disaster. The government was only telling nations that “Nuclear is safe”. Even after the accident they did not fulfil accountability of the accident”. The explanation “it is safe” is known as “myth of safety” in Japan, and dodges risks and problems of nuclear. The accident proved it is a myth. Tragically, it was the fourth exposure for Japan. Atomic bombs in Hiroshima and Nagasaki in August 1945, and Daigo Fukuryū Maru, which encountered a thermonuclear test on Bikini Atoll. Japan is the only country experienced atomic bomb attacks and experienced so many exposures. There is a question, why Japanese government could build 54 nuclear reactors in the country experienced so many exposures, and earthquake-prone country with “myth of safety”? The story started from an incident of Daigo Fukuryū Maru in 1954, and two key persons` ambitious dreams for nuclear energy. The third atomic bomb exposure, Daigo Fukuryū Maru and speculation of U.S.
After the Second World War, there was cold war between U.S. and Soviet Union fighting for geographical hegemony, but also for priority of nuclear technological development and creation of nuclearized military bloc. In 1953, Soviet Union succeeded a hydrogen bomb test, and U.S. found difficulties to keep priority of nuclear weapon technology. Also U.S. felt a chance of spreading nuclear weapons through Soviet Union to other communism countries. To control nuclear weapon development, then president of U.S., Dwight D. Eisenhower made a speech, “Atoms for Peace” as the same year in United Nation. It was encouraging introduction of nuclear energy to other nations to create U.S.` nuclearized military bloc. At this moment, Japan was not on the list of countries that where allowed nuclear materials and technology, because it was enemy of Second World War. Four months later, on 1st March 1954, a tuna fishing boat, Daigo Fukuryū Maru (Lucky Dragon 5) encountered to a secret nuclear bomb device test, U.S.` Castle Bravo, on Bikini Atoll. There were 23 crew members on the boat, and exposed from nuclear fallout. It was only nine years after the atomic bombs in Hiroshima and Nagasaki. People witnessed on the television that how crew members` health conditions got worse day by day. Due to the continuous nuclear bomb test by U.S., radiation was founded from tuna fish, and rain. Moreover, one of the crews, Aikichi Kuboyama died in six and half months later by acute radiation syndrome. It was a huge shock for Japanese citizens, because people did not know what really happened in Hiroshima and Nagasaki at that time due to information control by the government. Then, anti-nuclear weapon and anti-American movement was escalated. Mothers in Tokyo started collecting signatures to against atomic and hydrogen bombs, and one and half year later, they collected about 30million signatures, which was more than half of adult population in Japan. At the time, United States was considering Japan as only one anti-communism bastion in the Far East. Thus, U.S. had a fear that Japanese citizens` anti-American movement can result Japan to turn over to Soviet side. A document from Department of State is reported about the Daigo Fukuryū Maru incident as following. The violence of Japanese reactions to any matter relating to nuclear weapons is an element in all of our relations with Japan and raises particular problems in connection with any further U.S. tests in the pacific as well as in relation to U.S.-actions in the development of peaceful use of nuclear energy. That moment, U.S. was seeking a new policy on Japan to ease up on anti-atomic bombs and anti-American sentiment. At this meeting, Hidetoshi Shibata advised him “Japan has a proverb that poison drives out poison. Nuclear is a double-edged sword. To drive anti-atomic bomb, we should spread peaceful use of nuclear power, and give them hope.” After one month from the accident, U.S. made a nuclear research treaty with Japan to offer enriched uranium. Yomiuri Newspaper, and its television station, Nihon Television took the “Atoms for Peace” campaign under the Hidetoshi Shibata and Matsutaro Shoriki. Media was under the control, but also there must be some politicians promote nuclear power development at the parliament. Ironically, a politician, Yasuhiro Nakasone, passed nuclear power budget in the parliament on the next day of Daigo Fukuryū Maru incident. He was the person who promoted nuclear power policy radically in the parliament, later with Taro Shoriki who became the first head of Atomic Energy Commission of Japan. Japan and U.S. governments made a deal that instead of giving nuclear power technology to Japan, Japanese government promised not to pursue legal liability of Daigo Fukuryū Maru. It was only after nine months from the incident, and politically completed with a little amount of consolation payment. The payment was only less than one third of estimated total financial damage, and it was not paid other hundreds fisher men who also exposed. One of the crews, Matahichi Oishi, stated in his book “Japanese nuclear power started from here. Victims from Bikini were used as sacrifices of Japanese nuclear power”. Matsuaro Shoriki is known as “Father of nuclear” in Japan. After he resigned from police, he started Yomiuri Newspaper with small number of circulations and it grew the biggest newspaper company in the world today. His success in media business and his connections from working experience in police, grabbed attention of CIA. U.S. government gave CIA names to Yomiuri newspaper (POBULK), Nihon television (PODALTON), and Matsutaro Shoriki (PODAM). It shows how Shoriki was close and important person for U.S. He used all his connections and chances to contribute promotion of nuclear energy development. He had one definite dream. It was to establish a microwave network in Japan. By doing so, he can gain all broadcast and correspondence business in his hand. To do so, he had to loan 10 million dollars from U.S., approval of the loan from Japanese government, and a license for Public Telecommunication to enter the business. He made every effort to achieve it, but he realized one thing. He himself had to be the Prime Minister of Japan to realize his dream. When he met with the American agent, Daniel S. Watson who was meeting with Shibata, Watson told him about “Atoms for Peace” and how nuclear energy can be an important power supply in such a nation poor in resources. Watson looked back when he talked about it to Shoriki, “his eyes were sparkling”. Shoriki used “Atoms for Peace” as a political card to achieve his ambitious dream. In 1955, he became a politician and took an important role as the first head of Atomic Energy Commission. His contribution to shifting public opinion toward pro-nuclear energy made possible to build 54 nuclear reactors in Japan. A professor from Beijing University, Naoki Yamaguchi thinks “Closed relations between industrial, bureaucrat, and academic worlds were due to oblivion of Daigo Fukuryū Maru incident, and short view of richness. The oblivion was led by the “Atoms for Peace” campaign by Yomiuri Newspaper”. He was already 69 years old when he became a politician, so he radically pushed forward the nuclear energy introduction. However, due to his ambition for being Prime Minister, U.S. start taking distance from him, and the ambition was failed. Abruptly, his dream of microwave network was ended with telecommunication and broadcast satellite. During the war, he was in navy, and at the end of the war, he was a major of a feet. He experienced defeat of war at the forefront. Nakasone became politician, and he was invited to “International Problem Summer Seminar” at Harvard University in 1953. He was anti-communism politician. After the seminar, he visited nuclear facilities and in New York he saw new energy policy “Atoms for Peace” speech on newspapers, and thought “The age of atoms will come”. In a speech of Ibaraki nuclear station`s 50th anniversary in 2007, Nakasone also explained his feeling in New York “I thought it would be serious problem, Japan will tumble to an agrarian country (if we have no energy and scientific technology)”. Also he had a concern of Japan`s communization, due to the poverty. He also had another concern, the defeat of war was because of scientific technology`s backward. Moreover, Nakasone was one of military resurgence advocates. Therefore, it was necessary to promote nuclear technology research. However, from reflection of the war, many scientists were negative toward nuclear technology research. Thereupon, Nakasone and his comrades push nuclear budget of 235 million yen (the then general account of national budget was about 1 trillion yen) in the final stage of the budget resolution at the parliament. Later he noted the budget of 235million yen was just because of Uranium-235. The then ruling party, Jiyu-tou (Freedom Party) opposed the budget, but the party could not refuse, because it was at the final stage and they had to pass the budget at the Lower House. It was on 2nd of March 1954, only four months after the “Atoms for Peace” speech, and two weeks before Japanese nations know the Daigo Fukuryū Maru incident. Due to the budget, scientists started arguing how to develop nuclear research, rather than presence or absence of nuclear technology development. One month after the passage of the nuclear budget, Science Council of Japan declared “Peaceful statement of Atoms”, three principles of democratization, self-discipline, and openness to prevent military use of nuclear. Nakasone also involved to the creation of the three principles. It eased scientists to feel less guilt to involve nuclear development, and the budget attracted many scientists to the field. Later, it resulted to produce many scholars beholden to the government, and spread “myth of safety”, remaining only self-discipline, but not democratization and openness. After the Fukushima Daiichi nuclear accident, Asahi Newspaper interviewed Nakasone (94) on 26 April 2011, and he stated “it was very deplorable for all the people who live on the periphery of the station. But nuclear policy should be maintained and promoted continuously”. His dream of nuclear technology development is still on the process, due to the failure of fast breeder reactor development, reuse technology of spent fuel, and waste disposal method. However, it is important to remember development of the first breeder reactor is already given up by U.S., England, Germany, and Italy. After the nuclear budget by Nakasone and nuclear campaign by Shoriki, there was a common view that nuclear weapon is vice, but nuclear power development is virtue. From 1960s, due to the industrial development, oil shocks, concern of CO2 emission, and development of nuclear technology escalated erection of nuclear power stations as firm national policy. But also, the 1970s was the period that environmental pollution was rising as a serious social issue, and nuclear accidents Three Mile Island in 1979 and Chernobyl in 1986 reminded the its risks. Thus protest movements were also warming up in proposed area in countryside. The oldest anti-nuclear scientific citizens` organization (instituted in 1975), Citizens` Nuclear Information Center, Baku Nishio said “it was difficult to against proliferation after a foundation of the first reactor, but except one nuclear station, there is no new nuclear station was brought into operation from 1970s due to the citizen`s movements”. However, the government and electric companies spread money and used media campaign with pro-nuclear scholars to restrain people. Fukushima Daiichi nuclear station in Okuma-town was one of these nuclear proposed that attracted local governors as local revitalization in the beginning of 1960s without risk and safety discussion. 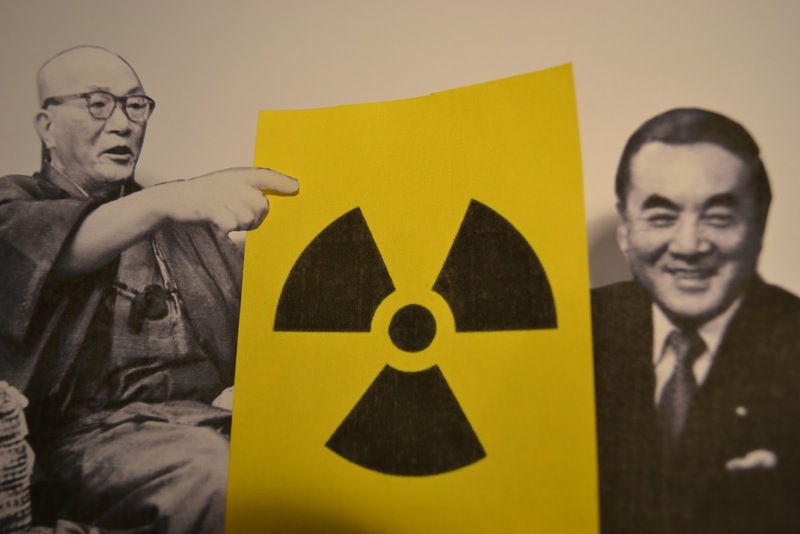 The “myth of safety” was created by strong governmental propaganda as Nakasone wished and media campaign as Shoriki did, resulted fourth nuclear exposure of Fukushima. Of course it is only several causes out of hundreds, but it is how started. Two men`s ambitious dreams did not come true, but their nuclear policy and system still exist even after the nightmare of Fukushima today in Japan.